This new book looks quite interesting. For as long has humans have lived in communities, storytelling has bound people to each other and to their environments. In recent times, scholars have noted how social networks arise around issues of resource and ecological management. 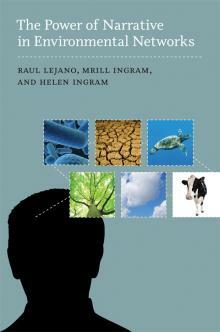 In this book, Raul Lejano, Mrill Ingram, and Helen Ingram argue that stories, or narratives, play a key role in these networks—that environmental communities “narrate themselves into existence.” The authors propose the notion of the narrative-network, and introduce innovative tools to analyze the plots, characters, and events that inform environmental action. Their analysis sheds light on how environmental networks can emerge in unlikely contexts and sustain themselves against great odds. The authors present three case studies that demonstrate the power of narrative and narratology in the analysis of environmental networks: a conservation network in the Sonoran Desert, which achieved some success despite U.S.-Mexico border issues; a narrative that bridged differences between community and scientists in the Turtle Islands; and networks of researchers and farmers who collaborated to develop and sustain alternative agriculture practice in the face of government inaction. These cases demonstrate that by paying attention to language and storytelling, we can improve our understanding of environmental behavior and even change it in positive ways. Raul Lejano is Associate Professor in the Steinhardt School of Culture, Education, and Human Development at New York University and the author of Frameworks for Policy Analysis: Merging Text and Context. Mrill Ingram, a PhD in Geography, is an independent scholar in Madison, Wisconsin and Associate Director of the Gaining Ground Project at the Farley Center for Peace, Justice, and Sustainability.